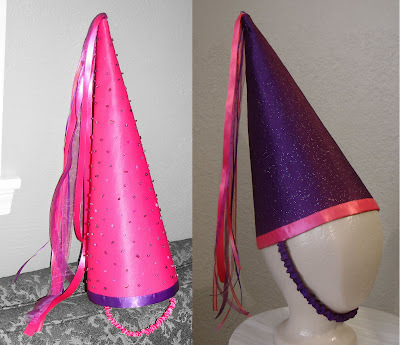 Auntie Em's Studio: Princess hats for everyone! For my niece's third birthday I made her a matching princess hat and tutu. A year and a half later, they are still a favorite toy for her and her friends, particularly the hat. My sister-in-law recently requested a similar hat as a birthday gift for one of my niece's friends. The first hat I made I had to experiment with ways to make it stand up without drooping over and happened upon some thick fusible interfacing in the remnant bin at my local fabric store. It was the perfect amount and worked wonderfully. I spent a bit of time figuring out just how the stuff works and how to get it to do what I wanted. Partly to cover some mistakes, and partly for decoration, I hand stitched beads all over the hat. About halfway through I was regretting that decision, but it looked really good once it was all finished. For the second go round I got glittery fabric for added sparkle without the time consuming task of beading the entire thing. Since I already knew what I was doing, the whole thing went quite a bit faster, and turned out quite nicely! On the left is the hat I made a couple of years ago. On the right is the newer version. The second time making something is always a bit easier. The purple hat didn't take nearly as long and I didn't make nearly as many mistakes. The more I make the quicker I'll get. And soon there will be princess hats in my etsy shop!